The Indian festivals are the symbol of merrymaking and social entertainment. They reflect our rich cultural heritage. They add colour and delight to our social life. All nations, all communities have their festivals. But they are not as varied have in India. Our festivals have become an integral part of our life and culture. They are aimed at providing us various pleasures in our busy lives. The festivals in India are mainly of two types such as: national and religious. Most of the festivals are related to our legends or myths or religious beliefs. Some of them are connected with the memories of some great men or women or some past incidents. The national festivals are connected with some days or persons or incidents of national importance. They are the Independence Day, the Republic Day, the Children's Day, the Teachers' Day, the Gandhi Jayanti, etc. Their days are declared as national holidays. All these days are celebrated with great enthusiasm in schools and colleges. The Independence Day and the Republic Day are celebrated with pomp and ceremony in New Delhi and the state capitals. People witness the ceremonial parade with great interest at these places. 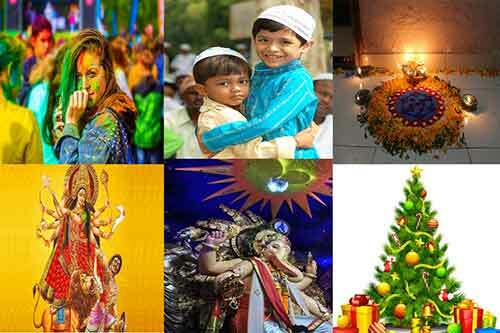 The religious festivals arc quite related to man and his customs, faiths, traditions, myths, etc. They as varied as the Indians. The religious festivals of the Hindus are Holy, Diwali, Dussehra, Janmashtami, Basant Panchami, Ganesh Chaturthi, Pongal, Cnam and so on. The Muslims have Eid-ul-Fitr, the Christians have Christmas, Good Friday and the Easter, the Buddhists celebrate Buddha Purnima, and the Jainas have Mahavir Jayanti. Each of these festivals has its speciality and is celebrated in a special manner. Holi is a festival of colour. It is celebrated all over India. It is celebrated in memory of Radha Krishna. Though it a Hindu festival, people of other faiths in India join this festival of colour. They put coloured water or colour powder(rangoli) on their friends as a token of love and good wishes. They exchange sweets among themselves. Diwali is the festival of lights and crackers. It is celebrated in memory of Ramachandra's coronation in Ayodhya after his return from Lanka. It is a symbol of dispelling darkness through the light. They decorate their houses with earthen lamps and candles. They perform 'shraddha' and show lighted torches to their forefathers who are supposed to go back to heaven on this day. The businessmen celebrate Diwali as a day of opening their new accounts and worship Goddess Laxmi. Dussehra is a festival observed all over India. It is known as Vijay a Dashami. In north India, it is observed to mark Rama's victory over Ravana or the victory of good over evil. In Bengal and Odisha, Goddess Durga is worshipped as the destroyer of demon king Mahishasura. The peasants and artisans offer their puja to their tools and implements with all rejoicings. Krishna Janmashtami is celebrated as the birthday of Lord Krishna. People go to the temples of Lord Krishna and offer their prayers and perform puja. They celebrate it as a day of fasting and take prasad after offering their prayers. Basanta Panchami marks the birthday of Saraswati, the Goddess of Learning. It is celebrated in a!most all the educational institutions of Odisha and Bengal. Students offer their puja before the image of the deity in their respective schools and colleges to invoke her blessings. In northern India, this day is observed as a spring festival marking the end of winter and the advent of spring. Ganesh Chaturthi is celebrated in the month of June as the birthday of Lord Ganesh, the god of wisdom and the destroyer of evils. This is also celebrated in educational institutions of Odisha. This is a public festival in a western and southern part of India. It is observed for nine days in some places. Pongal is also an important festival in southern India. It is observed for three days in feasting and rejoicing. People exchange Pongal greetings with one another. They put on new clothes and spend these three days with their family and friends. Onam is a popular festival in Kerala; It is a festival of merriment. Eid:ul-Fitr is a Muslim festival marking the end of Ramadan, The Muslims who fast the whole month of Ramzan break their fast on this day with feasting and merry-making, They give alms to the beggars on the occasion of Id. Christmas is a festival of the Christians. It starts on 25th December, the birthday of Jesus Christ. The Christians plant Christmas trees in their houses and decorate them with light and colour. They prepare Christmas cakes and exchange Christmas gifts with one another. Festivals are associated with our social life and customs. They are a kind of diversion in our routine life and are aimed at giving us pleasure and rejoicing. They also offer us rest and recreation and fill us with a new spirit and now vigour. The Festivals are social gatherings and a renewal of friendly ties. The religious festivals fill us with sacred thoughts and purify our minds and hearts. They remind us our rich cultural heritage and fill us with pride. They are also the occasions to acquaint our young generation with our rich cultural heritage. Thus they help us keep up our traditions. The Indian festivals are meant to create a healthy tradition of friendship and brotherhood. But they should not be celebrated to show off our wealth and riches. They should not give place to any ill-feeling among different communities. The festivals have been celebrated with an intention to strengthen our social life, and we should never forget this. Ours is a country of varieties with people of varied traditions. While celebrating our festivals we should give respect to the traditions and practices of other people. We should not hurt others' feelings by any means. We should all think that we may differ in traditions but we are bound by one culture, and we are Indians forever. Don't Try to duplicate our Content. Copying content from website- essaywritingart.com is ILLEGAL. Copying and using any content is ILLEGAL, If you do, then we have a right to take LEGAL ACTION.